"Double Circle" means the community which evolves infinitely by the energy and ICT in the smart community project. People who live in Kawasaki become a hero, and beat an enemy who steals near from the time-stopped world to the evolving town Kawasaki. 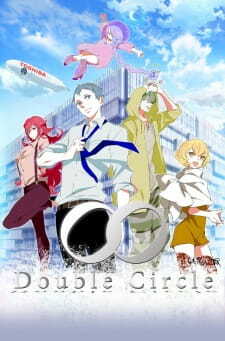 Double circle is in the same class as shorts like the next A-class, in as far as it's an advertisement for something that the creator has done or is planning to do. They're a tiny section of the market in the west, however it's something that needs to be said in the preamble as it's something that should always be kept in mind. The story is simple, a loose connection of shorts with the overarching theme of making a better city. It's not "great", but there is something there that kept my interest for the entire time I was watching. It left me wanting more, which is a shame as that's not likely to happen at all. For what's there, it'd get a above average, if not for the fact that the time of each episode didn't let the plot points flourish well enough to be satisfying. Graphically, the show is gorgeous. The lines are crisp, the character designs are unique yet with clear personality in with what they wear, and even down to the mech suits. That being said, however, the 3D elements for the most part are somewhat jarring, in the same way that watching Kemono Friends for the first time can be somewhat jarring at the start. Unfortunately, they stay jarring when it's mixed with the more traditional style, due to the overall length of the series, and at the very end the fully 3d section looks, frankly, disappointing. A shame considering the ideas behind the show, however they're in line with other mid level 3d "walk through" of concept design work at that scale. The music is great, the end theme is enjoyable, but the sound effects and voice acting could use some more work. Each hit has the slightest amount of impact, and the few times that they had the right impact, it was too late to add anything as the fight was already over. Not only that, but the characters don't add enough emotion into the script, leaving it more as a thing that's there. That said, they all mesh together well, there wasn't a moment I had trouble hearing a character talk, and when the music is needed to, it turns itself up to 10.5. The Characterisation is, unfortunately, bog standard. There is the slightest hint of depth to each character, and the plot about why the bad guy is like they are bumps it up that ever so slight bit. They're not bad, just bland, and what they have that makes them unique isn't explored well enough to be notable. Double Circle is good - for what's there at least. Whether intentional or not, it stays long enough to keep the fun from the action, and the small slices of life nice and fresh, however it's lack of time it could play with makes it leave something in your mouth that you can't quite nail down. You won't normally find an effectiveness rating, however for a show that's trying to sell you on something, in this case an idea, it's something I like to have. It doesn't sell what it is well. The overall idea seems to be a proposal to make Kawasaki into a smart, green city. The main plot has characters that are trying to take away from the beauty and effectiveness of the city, with the heroes having to stop them. They're not trying to stop the progress itself, just make what's already there dull and drab. With no hint within the show itself about it being a proposal other than the very final credits showing a short 3d render of ideas for Kawasaki streets, to the fact that one of the main buildings in the show is a toshiba city block, it doesn't really find it's footing in selling you on the idea of a green city, and instead it feels "wrong". Double Circle isn't bad, and the overall length of it means it's a great little time waster if nothing else. It gives more of a taste of great ideas that will sadly not get picked up on any further, however that might be for the best. If you're bored, give it a shot, and if you don't enjoy it, at least it's not too long of a time spent on it. Anyways, let me get started with this review! To be honest I haven't watched an ONA before so I figured that Double Circle would be my first. I was coming in with all of these high hopes and I realize now that was a big mistake. The first episode introduces the "colour-coded" individuals and gives some background to the story. Asagi (Gray hair), Emu (Green), Nanoha (Yellow), Akane (Red) & Tama (Purple) are all part of the "Smart Community Project" in which they aim to improve/evolve technology and make it more accessible. I gave the story a 4 because of just how incredibly random it is. How it can go from school, to planning a surprise party, to fighting a sludgy black "thing" that steals the energy from everything it touches called Niirobi, to changing into super-powered mecha suits and still grab your attention is beyond me. The one fight scene dragged onto the second episode and then it ended abruptly. Just no. The next thing that I'd like to say is that the characters literally have no personality at all but if I had to say that they did, they're pretty generic: Asagi - Likes to get things done/Mr. Popular?, Nanoha - Geek/Brains of the group, Akane - Boss that runs this s#@!, Emu - Lazy. I purposely left out Tama, as she has an interesting back-story surrounding Niibiro and her homeland (she's an alien). Action animations such as this that have no story whatsoever completely throw me off. I enjoyed it somewhat because of the art and the mechs but they get old pretty quickly. I'm not interested enough in this to watch every single episode. To put it bluntly it's terrible, not to mention that one episode gets put out every month. If the story was memorable then maybe I'd understand but that's not the case at all. There are so many better things to watch, I'd say this is a waste of 6 minutes.